For me, I would say I am a big fan of bubble tea. Still miss the time when I was studying in Melbourne and take bus back to my house will pass by this bubble tea located at Box Hill Train Station which will definitely walk pass by there. Me and my housemate got addicted till we had 4-5 cups a week till we know most of the people working in there and get to have special mix combination that not in the menu. 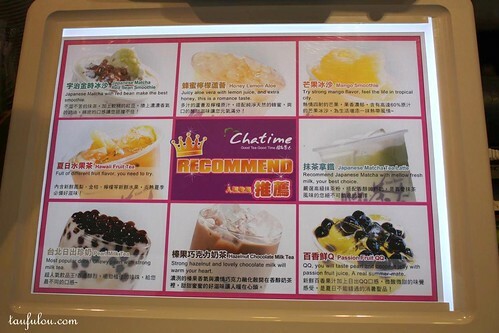 Chatime had landed in Malaysia. After so long, to get a very nice bubble tea in KL is very hard, not until recently I heard one of my friend mention that one of our friend opening a famous Bubble Tea from Taiwan very soon and asking me to watch out. 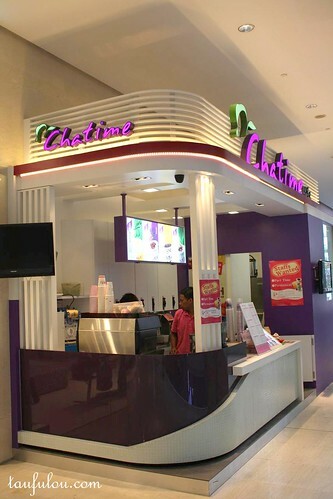 It was not till I heard they are the master owner of this very famous brand for Malaysia market Chatime which located at hottest shopping location area, Level 4, Pavilion (in front of True Fitness). Not to mention I have recently came back from Taiwan and only realise that actual bubble tea is so much different compare to our local market that they have in the mall or pasar malam. They acutally have a very original taste of tea of the mixture rather than most of them are using powder. 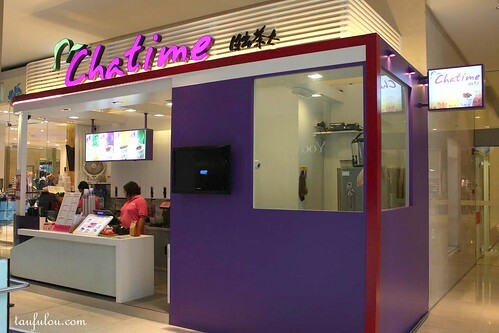 Chatime is quite a well know brand which spread its wings with more than 300 outlets across the globe. One of the drinks to look for is that they do not really use powder but nicely brew tea, mix and match of alot of flavours. Upon ordering we are able to choose less sugar or more sugar just like it is as I experience in Taiwan. They have long list of drinks available but this are so far their signature or recommended drink. So far I like both Snowflakes and Chatime Bubble tea range, something that I would definitely want to have when I go to Pavilion. Lol…. i want to try it but are they same quality as the taiwan ar??? Love Pearl milk tea too! Never tried this before.. tried one from Each A Cup, not bad too! eh didn’t notice this new kiosk when I was there… feel like having one now!! I am interested to know more on the franchise program. Pls provide me more info. Thanks! err..i’ll ask my friend to email you . 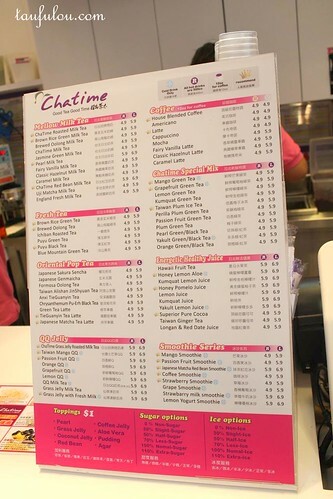 ..
may advice the franchise program of chatime?? v are interested with it, tq!! could you please tell me more about the franchise program? Hi, I am interested to know more on the franchise program. can you ask someone to contact me? Nice review. Also, izzit possible to ask ur fren to email me the franchising details? I will still call the contact. Thanks. im interest know more infomation about the franchice….can u send me the detail?? please call their office number to find out more on their franchise.. Anyone can give me the details on it? can you please call their office number as specify at the bottom of the blog post..thank you..
as I know so far, they currently close their Franchise inquiry till end of the year.. to focus on current franchisee..
u can give it a try to call them . .
Just wondering is chatime halal? i am not sure the status..but then i do see alot of malay buying the drink..
.,,your product is very good! !..highly recommended! !..how to franchise?..do you have any office here in the philippines?.. So interested…I would like to know regarding chattime franchise program…cau u send me details? hey, can u send some about the chatime franchise detail to me??? i got calling ur office but hvnt ppl hang up so pls send the detail to my mail 1 after tat i will call u… thanks…. 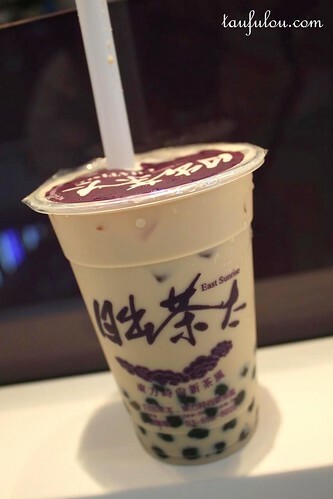 i am sorry, i just blog about the place..
unfortunately.. you still have to call their office to get more details..
My whole family like the bubble tea so much and we are very interesting to start franchise business. Pls provide me more infomation to my mail. I am sorry, please call their office number as mention in my blog for franchise enquiry .. Hi! 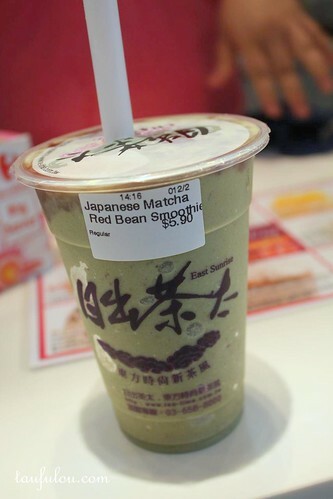 !im living in the phils and im interested to franchise your milk tea. Can you please provide me with the full details how much gonna cost me and what are the included. I am not the franchise owner.. please call their office number to find out more. . I would like to know about your franchise program regarding the bubble tea. please call their office as number provided..thanks . . I have tasted the tea in bangkok,is it wonderful. Pls Pm me the details of franchise in Malaysia. Thanks. Pls sent me the details of FRANCHISE in Malaysia. i really interested to open chatime. can you sent me the information about this busines. i hope we can keep in touch. sorry Biherwan. As below my blog post I have include their office number. Can you please give them a call. I’m interesting in chat time bubbles tea franchises,may I knw watt should I do?? I am interest for frenchise in Thailand. Please give me more details and contact at email given as above. How come the same product taste differently in china compare to Malaysia? A friend of mine initially wanted to open a frenchise in china after tasting it in Malaysia but he gives a second thought after tasting it back in china. Also, Please provide me the details and contact to join frenchise both in Malaysia and China. please do contact them to their office number at the end of the blog post.